This article assumes you have at least basic knowledge of linux, know how to use the shell, and most importantly, you host your site on your own VPS. The installation is quite simple. I will show you through the step by step installation cherokee on centos 6. Step 2. Installing Cherokee Web Server using Yum. Step 3. Configuring Cherokee web server. Important: The password is for one time use only. If you need to login again, you should use the same command for generating it. Step 4. 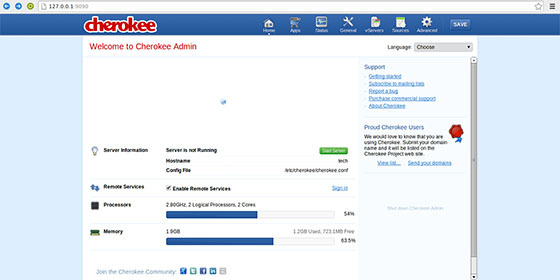 Now access Cherokee-Admin by navigating your browser to http://127.0.0.1:9090. Type user name and password for accessing it. Congratulation’s! You have successfully installed Cherokee. Thanks for using this tutorial for installting cherokee web server on CentOS 6 systems. Related Posts of "How To Install Cherokee Web Server on CentOS 6"